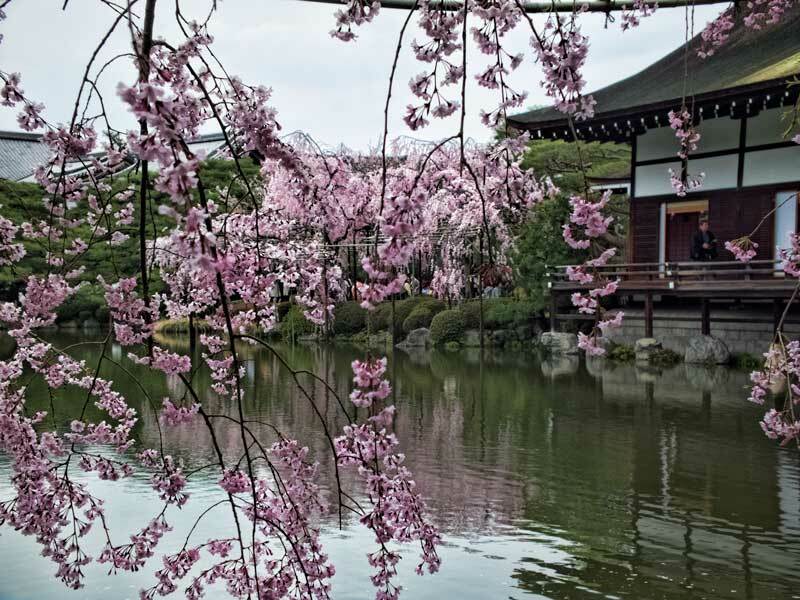 Headed to Kyoto for spring time? It’s one of our favourite sakura spots in Japan so here are some of the best locations and events for viewing cherry blossom in Kyoto. 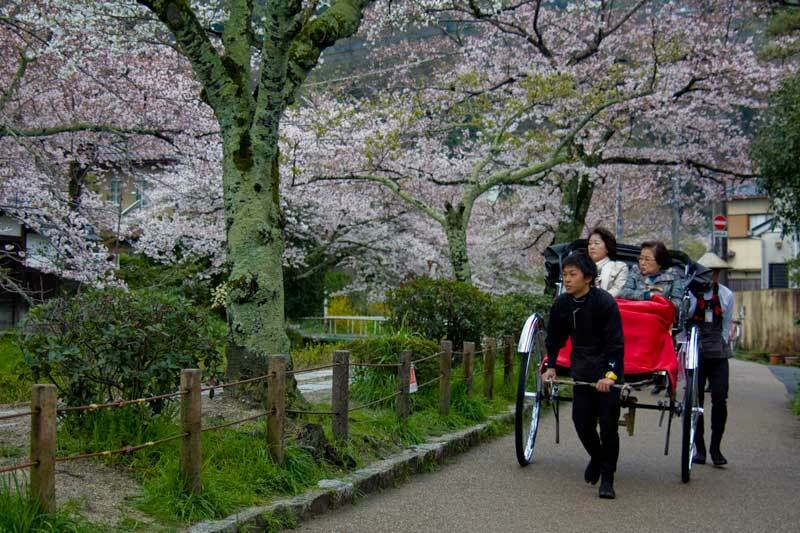 In early March cherry blossom fever hits Kyoto. The ume (peach blossom) are wafting their delicious scent across the city and the first early cherry blossoms are spotted. My Instagram feed starts to fill with the beautiful blooms and all the seasonal releases start dropping. The Japanese word for cherry blossoms is sakura and it encompasses everything from the flower itself to the season, celebration and flavour. From the choux cream puffs oozing sakura custard to the special release KitKats, the delicate traditional wagashi to Starbucks sakura frappe, a limited release of sakura is as excitedly anticipated as Christmas morning back home. 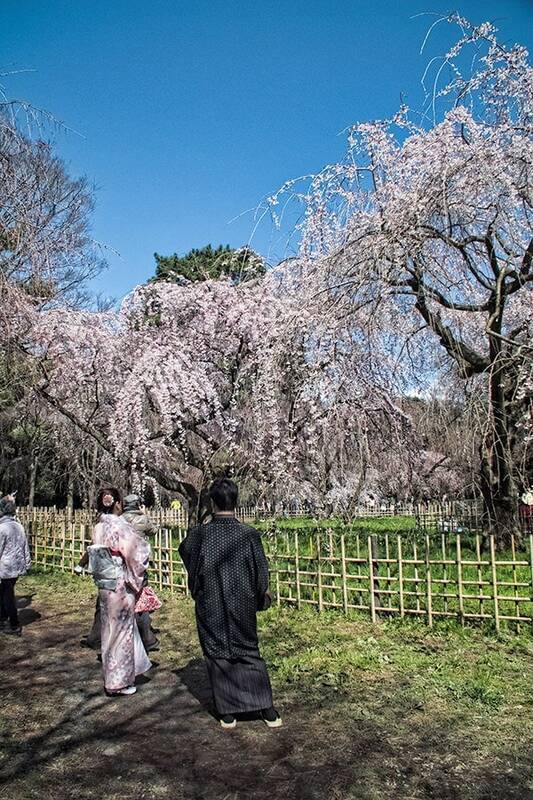 We’ve been very lucky that so far two of our visits to Japan have perfectly captured the full cherry blossom season. From those first early blooms that tease us, through bud burst, peak blooming and finally petal fall raining petals down on everyone and everything below. I love it all. Perhaps it’s because I live in the sub-tropics where spring and autumn don’t really exist but I have a bit of a love affair going with these delicate pink blooms. I don’t even really like pink but for two weeks, usually in early April in Kyoto, I will happily eat, drink and photograph pink from dawn till after dark. Those evening light-ups are magical. There are many places all across Japan to enjoy and celebrate the cherry blossom season but Kyoto is one of my favourites. It has such a variety of locations in close proximity to each other. These are my top Kyoto sakura spots and events, I hope you enjoy them as much as we do. Kiyomizudera is a large temple complex that is well worth a visit in any season but during the blossom it really is something special. During spring time there are special evening opening hours and light-up events or you can attend the Seiryu-e parade at the temple. 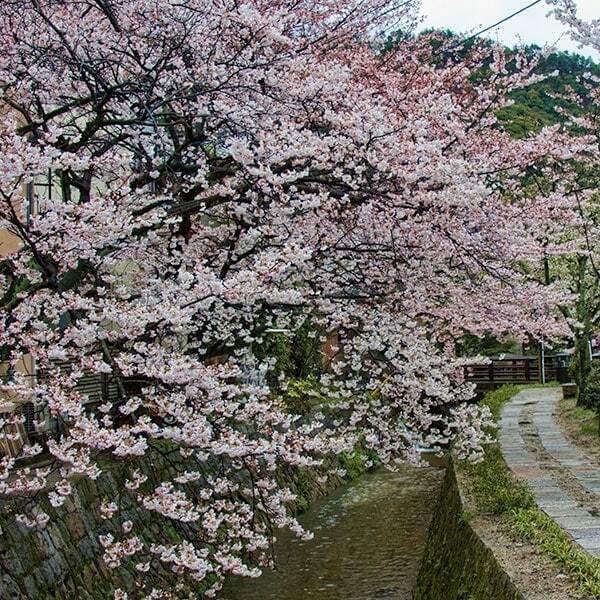 The Philosophers path is a walking path along the Shishigatani canal lined with cherry trees, maples and camellias. It runs for about 2km from Ginkakuji (the silver temple) in the north to Nanzen-ji in the south. There are a lot of interesting places to stop along the way so it’s worth walking the full length. These ones are also lit at night, for an evening stroll I’d recommend the Ginkakuji end. Following the link for more details to help plan your approach. Maruyama Park is behind Yasaka Shrine in central Kyoto. The park is the main spot for hanami gatherings in the city. There’s a lively feel and during weekends and evenings it will be packed. There’s a spectacular weeping cherry tree in the centre which is equally impressive day and night. The Imperial Palace dates back to when Kyoto was the capital of Japan in the Heian period. There are a lot of cherry trees here but at the northern end around Konoe pond is an impressive grouping of weeping cherry trees. We found these were in peak a little ahead of other places in the city. The castle grounds at Nijo Castle have a huge sakura display and it’s a top spot for the evening light up. The trees here are a mix of early, standard and late blooming so there is an extended display. The hill side in Arashiyama along the river is a spectacular sight when in full bloom although we found it was slightly later hitting peak than the rest of the city. 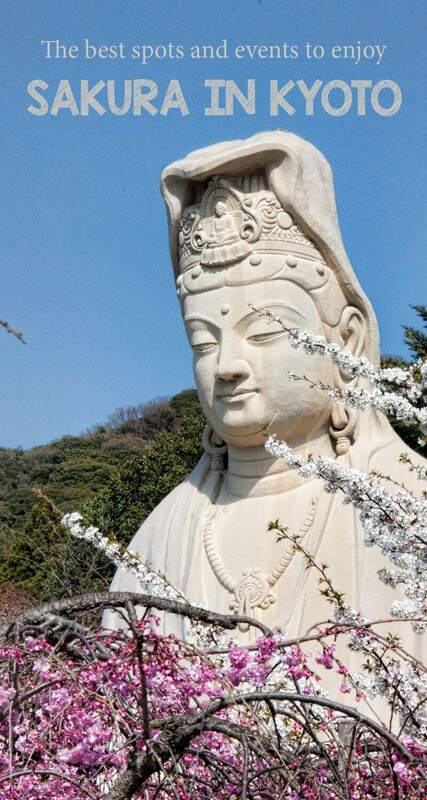 This is a great area to visit generally and for impressive sakura the zen temple of Tenryuji is excellent. Ryoanji is one of my favourite zen temples, not only does sakura peep above the walls of the enclosed meditation rock garden but take a walk around the lake afterwards, the blossoms flow from the lake edge, through the garden and up into the hillside beyond. 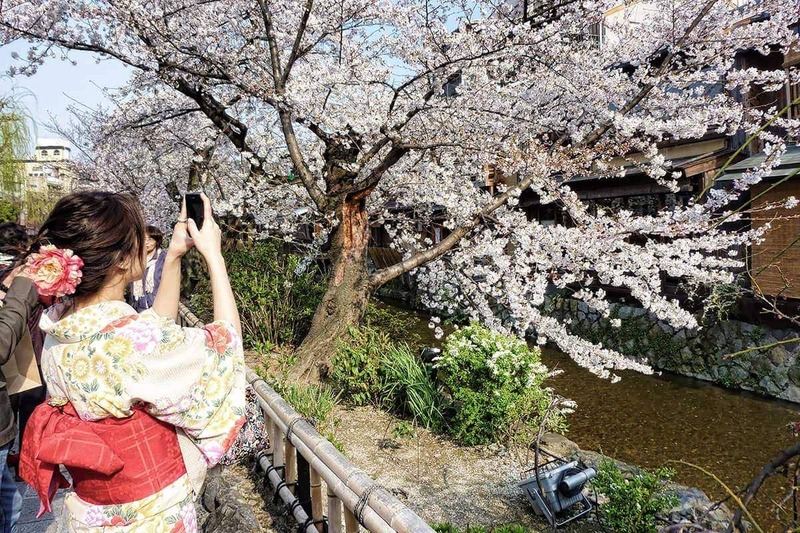 The cherry trees at Daigo-ji temple have been celebrated, with good reason, since the 16th century when Hideyoshi Toyotomi hosted sakura viewing parties here. This is a huge temple complex extending all the way up the mountain if you are up to the climb. It has over 1000 cherry trees that look stunning in full bloom. You’ll need the Tozai subway line to get out here, it’s a little further than some of the others but if you catch it right or can make it for the annual cherry blossom viewing parade it’s well worth it. Another great pick would be Heian Shrine in central Kyoto. While access to the shrine and grounds are free there is a small fee to enter the walled garden area but it’s well worth it, it’s one of the best displays of weeping cherry blossom. One the most anticipated annual sakura events are the nightly light ups held in several of the temples and parks. Some of these are free entry while others require an entry fee/donation. Some of the best free illuminations include the trees over the canals in central Kyoto especially the Shirakawa area, the philosophers path and the famous weeping cherry in Maruyama Park. Paid events occur across the city but Kiyomizudera is a must see, Nijo Castle and Kodaiji are highly recommended. Another spring event that coincides with the cherry blossom in Kyoto are the geisha spring dances. We went to the Miyako Odori performed by the Maiko and Geiko of the Gion Kobu district. It was a wonderful experience and we’d recommend the tea service. It’s not as intimate as a personal tea ceremony lesson if you want to actually learn about the customs around tea but it is the only way for most of us to see it performed by geisha. The Imperial Palace special opening, takes place in the first week of April not only to admire the beautiful display of trees by the lake but you can also wander through the enclosed palace grounds at this time of year without a booking or tour. 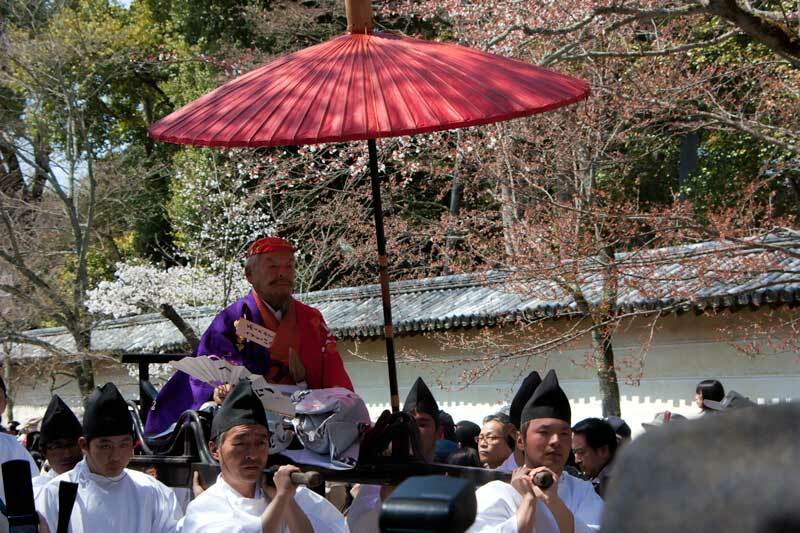 The Taiko Hanami Gyoretsu Procession at Daigo-ji Temple takes place on April 12th and is a recreation of Hideyoshi Toyotomi’s viewing party in the 16th century. Hideyoshi was one of the three great unifiers of Japan and this event is extremely popular with Japanese locals and visitors making it extremely crowded but absolutely worth it. 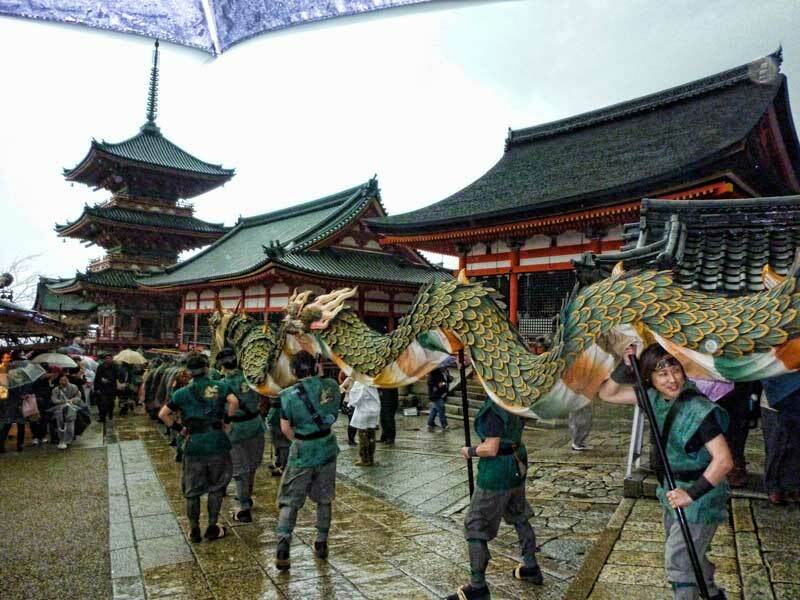 The blue dragon of Kiyomizudera temple makes a spring appearance for Seiryu-e on March 15-17 and April 3. 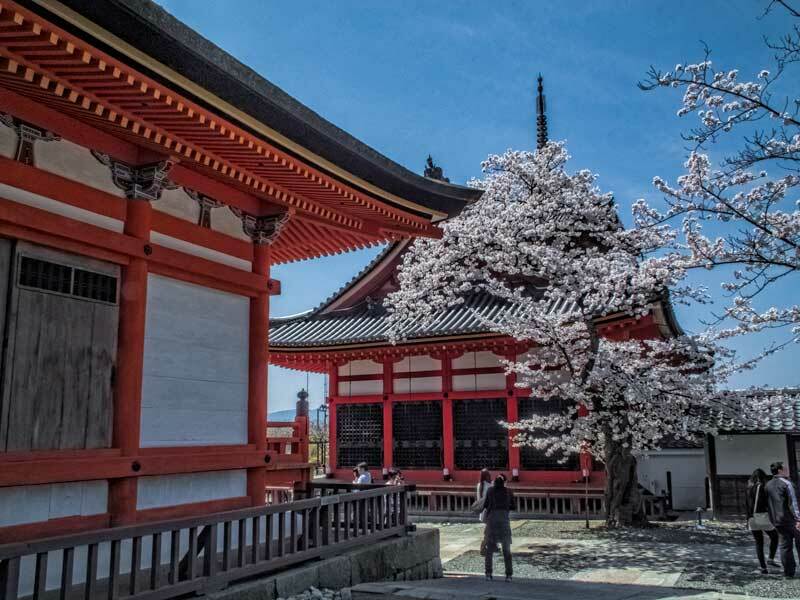 The April event often coincides with a great display of sakura blossom at the temple as it did for us. Hanami are sakura viewing parties. They’re hard to miss with large blue tarpaulins spread out and crowds of people eating, drinking and socialising in the fresh air beneath the flowering trees. Although people usually gather in larger groups there’s no reason not to have your own mini hanami. Most of the supplies you’ll need are available for a couple of dollars at the 100 yen shops. Arrive early to claim your spot, the popular areas fill up fast, stake out a space but don’t take up an unreasonable amount of space. When you’re picking your spot do consider the location of the toilets for convenience and rubbish bins which can overflow and be a bit too smelly later in the day. 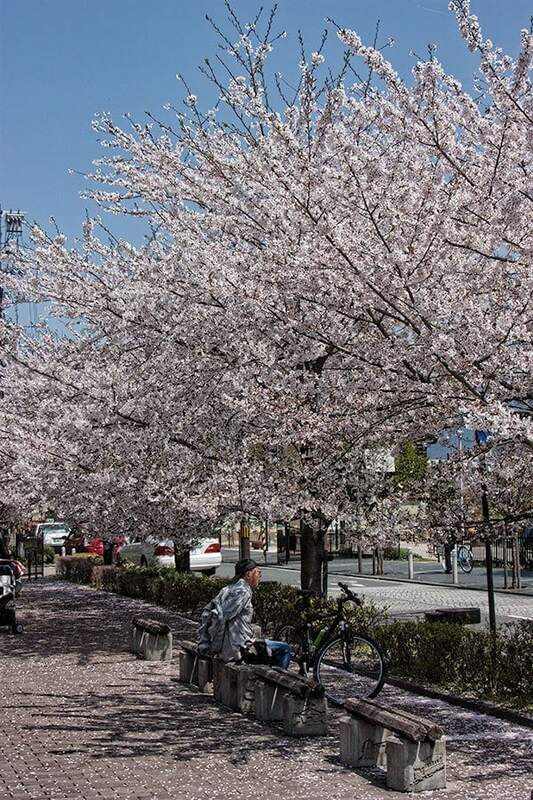 Most parks and public spaces with significant cherry trees are available for hanami but there are a few places where it isn’t allowed. Watch for signs and take your cue from the locals, if it’s a gorgeous spot and no one has staked it out there is probably a reason. Before you head out pick up a bento, some snacks from the convenience store or some tasty treats from a bakery or department store. 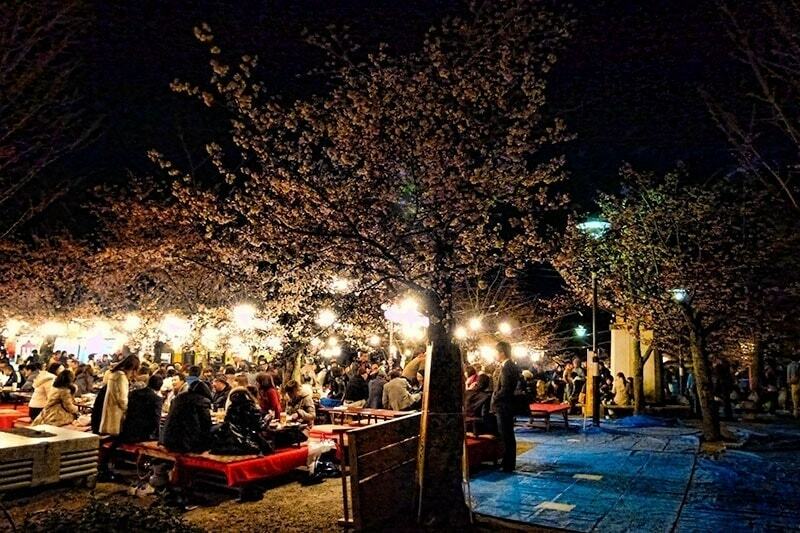 Some of the larger hanami areas like Maruyama Park will also have festival food stalls selling all the popular favourites like okonomiyaki, takoyaki, taiyaki, toffee strawberries and dango. It’s impossible to hit every spot at the peak of the season, after all it only lasts a couple of days. Having said that the anticipation of watching the first buds burst is part of the fun and many would say that hanafubuki (the petal fall) is really the very best time. Broken down hanafubuki means flower (hana) snow storm (fubuki) and it truly is like being in a swirling storm of soft fragrant petals as the wind picks them up and blows them around. As the time for your visit gets closer keep an eye on the sakura-zensen, the blooming forecast for the city. A simplified English update is available from this link. If you’re timing misses the sakura check the forecast above for other nearby spots which due to altitude and other factors may vary by a week or two in their peak blooming. At the bottom of this post I’ll mention some options and link a post on side trips you can make in a day from Kyoto. Catching a falling petal is good luck, or so the children believe. I chased a few just in case. On the other hand never pick a petal or a flowering branch from the tree in Japan. You will often seen quite a few young women walking around in kimono and their best yukata during blossom time. In addition to being a great reason to get dressed up and walk through the city many locations will give them free entry for wearing traditional dress as a little incentive. Sakura is a very special season to the Japanese and having been once you might very well become as hooked as we are. 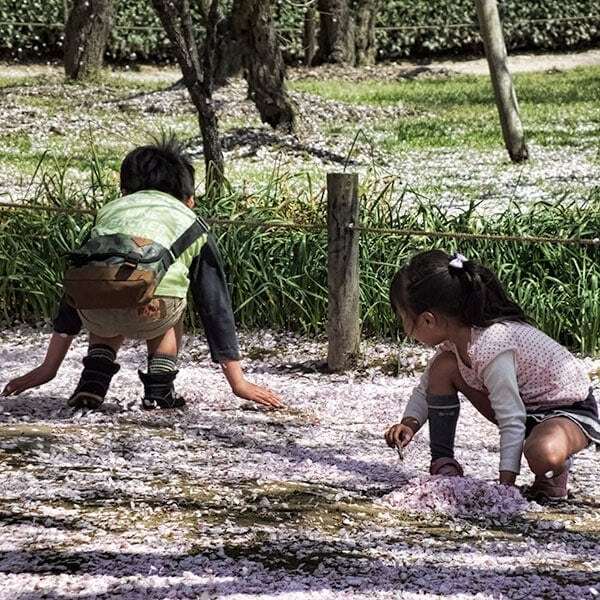 If you have a few more days and the blossoms are still going there are many viable day trips from a Kyoto base where the cherry blossom will make your experience extra special. Our post on the best day trips out of Kyoto give some ideas for side trips you might try but at this time of year I’d highly recommend Himeji Castle, Nagahama, Kanazawa and both the Shukkei-en garden and Miyajima Island in Hiroshima. Kyoto is a lovely place even without the cherry blossoms but in spring it must be magical. I love Japan and especially Kyoto, but have yet to travel there during Sakura season. Thanks for such a great round-up of the best places to see the blooms. Pinned this post for a future trip!! Thanks Jen, one of the great things about travelling in Japan is that there really isn’t a bad season, there’s always a highlight. I haven’t been to Japan yet and for some reason it has never been very high on my list. It looks really nice though…one day I will get there. Lucky you for the opportunity to visit Japan at the peak cherry blossom period. Really looking forward to seeing your pics for this year. Your detailed descriptions and best places to see them is wonderful. I’m saving this for my planned future visit to Japan. A nice read! Hi Toni! I loved your description of the blossoms. I’m not really into pick either, but the colors during this time are so fantastic. In the US, we have big festivals for cherry blossoms in Washington DC. I have yet to go, but like Japan, it is on my list. Hi Vicky! Oh I’ve seen a few pictures of the blossoms in Washington but didn’t realise they had all the festival and events around it too! Now I really want to get there too! Awesome info Toni, thanks for sharing. I actually just posted a blog about destinations for March / April and Japan for the cherry blossom festival was on that list, I’ll put a link in it to this post for people who want more in depth info and tips. If only the blooms stayed all year round – I don’t think I could ever get sick of how beautiful they make an otherwise normal looking street scene! 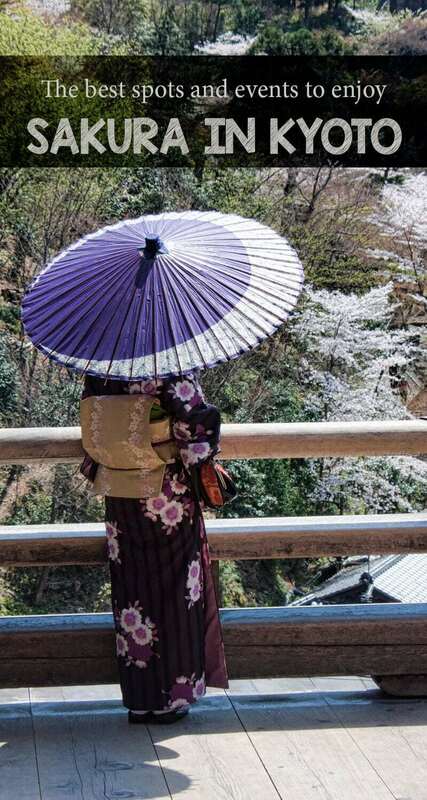 This post is perfectly timed and has me even more excited about our trip to Kyoto this April! I knew that we were going during prime, cherry-blossom time, but I wasn’t really sure what to expect. Thank you for putting together all of these unique suggestions. You have no idea how helpful this post is! You also made me realize that we will be there for The Taiko Hanami Gyoretsu… can’t wait! Oh I’m so excited for you. Have a wonderful trip, there’s so much to do at this time of year. 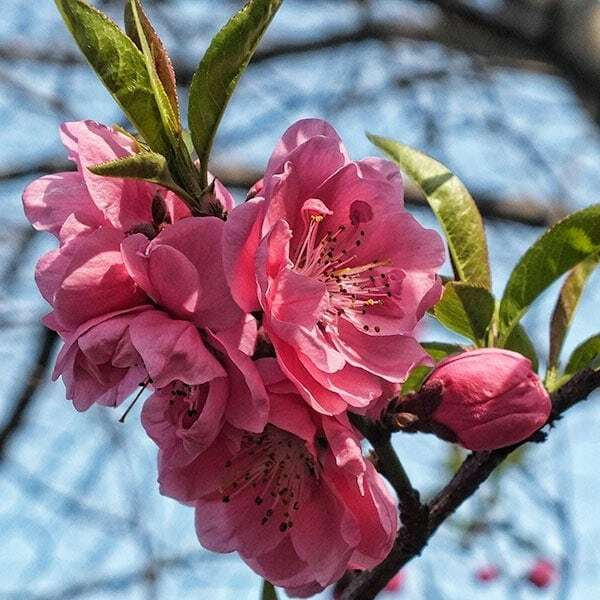 I’ve Always seen pink blossoms in manga cartoons and I’ve Always wanderes how it really feels and looks like. Now you are giving me a quite precise idea of it! Thank you I really wanna go there!!!!! Great information and wonderful photos. I was just thinking earlier tonight that I would like to visit Japan in the near future. Such a different culture and to visit during the cherry blossom season would be a great experience. I don’t know how you would choose which venues to visit, there are so many that look fantastic. I think that The Kiyomizudera Temple and the Philosophers Path would be my first choice and I would definitely have to check out a few of the nightly light ups. They’d be great choices, we’ve been to both several times and highly recommend them. Hope you get to make the visit, definitely a wonderful experience and a unique place to visit, although aren’t they all!